A’s closer Blake Treinen has been the most valuable pitcher in baseball according to win probability added. At midseason, the American League seemed decided. The number of tanking teams — some intentional efforts, some unintentional — combined with the AL’s super teams1 were conspiring to strip the league of postseason races. The league’s playoff teams seemed all but set by the All-Star Game. But then the Oakland A’s came charging out of the baseball wilderness to give us some late-summer drama. After three consecutive last-place finishes, the Athletics began the year with a 16 percent probability of reaching the postseason and a 6 percent chance of winning the AL West. And just two months ago, they were as many as 11.5 games behind the reigning World Series champion Astros. But after winning 42 of their last 58 games entering Friday, the A’s have cut that deficit to 1.5 games, and they now have an 89 percent chance of advancing to the postseason and a 22 percent chance of winning the AL West. So how did the A’s get here? This isn’t another “Moneyball” story. The once-undervalued metric of on-base percentage is no longer baseball’s best-kept secret — and it’s not even an Oakland staple. The A’s have instead pursued different paths to become one of the better teams in the major leagues despite opening the season with the game’s lowest payroll. While they have acquired fly-ball hitters like Jed Lowrie, Matt Joyce and Khris Davis, they have also developed anti-grounder sluggers in Matt Olson (2012 first-round pick) and Matt Chapman (2014 first-rounder). Lowrie told FiveThirtyEight that he never sat down with an A’s official to talk about his batted-ball profile, but the Stanford University product does use the technology available in the home batting cage for tracking his exit velocity and launch angle to fine-tune his swing. What on-base percentage was to the Moneyball A’s, fly-ball percentage is to this group of upstarts. That’s made them the league’s fourth-most efficient offense despite a near league-average on-base mark of .322. The A’s are also adapting to their environment. Lowrie notes that Oakland Coliseum is one of the most difficult places in the game to drive the ball, and while the A’s have the lowest ground-ball rate on the road in the majors at 37.8 percent, that rate spikes to 40.9 percent at home, good for eighth-lowest. While Lowrie says teammates Davis, Olson and Chapman can hit the ball “out of Yellowstone,” other A’s alter their approach depending on the ballpark environment. The A’s lead baseball in offensive efficiency on the road with 119 weighted runs created plus (wRC+), a stat that adjusts for park and run environment, with 100 representing league-average performance. But Oakland is only about average at home, with 96 wRC+. Lowrie noted that the A’s set a record for most consecutive road games with a home run this season4 and that they’ve done much more damage on the road. The Athletics rank 18th in the majors in home runs at home with 67, but they lead the majors in road homers with 106. They are one of the best road teams in baseball at 37-26. The early 2000s A’s rarely overpaid or valued relievers, believing them to be highly fungible. This Oakland team has the most dominant reliever in the game in Blake Treinen and has further bolstered its strong bullpen with trade acquisitions of Jeurys Familia (2.02 fielding-independent pitching, 19 strikeouts in 15 innings with the A’s) from the Mets and former Twins closer Fernando Rodney. Acquired as a buy-low target with a 5.73 ERA last July in a trade that sent Sean Doolittle and Ryan Madson to Washington, Treinen is second in the majors in relief WAR and owns a 1.00 ERA. While WAR may not be the optimum way to measure a reliever’s value, win probability added (WPA) accounts for the change in win expectancy between every plate appearance. According to WPA, Treinen has been the most valuable pitcher in baseball this season — ranking ahead of aces Max Scherzer, Jacob deGrom and Aaron Nola. His sinker leads the majors in whiffs per swing, and when put in play, it produces 4.6 ground balls for every fly ball. Per FanGraphs pitch values, it’s the fifth-best sinker in the majors. The pitch, with its combination of elite velocity and movement, can make opponents look foolish. Treinen also has a slider and cutter that baffle opponents. While the A’s have a dominant star in the bullpen, the story is different in the rotation. In the early 2000s, the A’s had a trio of front-line starters in Barry Zito, Mark Mulder and Tim Hudson. This year’s A’s team has a rotation populated predominantly by reclamation projects like Trevor Cahill, Brett Anderson, Mike Fiers and Edwin Jackson. Without a legit ace — or even a household name — the A’s rank second to the Red Sox in pitching WPA. 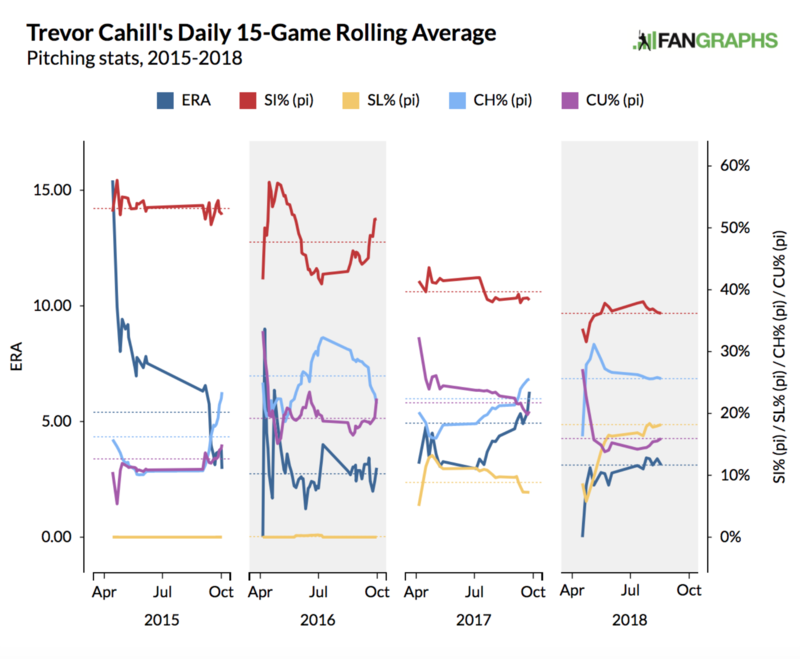 Signed to a one-year, $1.5 million contract in the winter, Cahill has become one of the biggest bargains in baseball in part by reducing the use of his fastball and generating more swing and miss with his slider, more than doubling its usage. Cahill has a 3.44 ERA, and his 2.1 WAR according to FanGraphs is the second-best mark of his career. Cahill had once been heavily dependent upon his sinker, but he told FiveThirtyEight that the A’s have given him “weighted pitch” data, which he’s used to diversity his overall pitch mix. For the first time since 2012, he has four above-average pitches, according to FanGraphs linear weights. “If you can throw four different pitches, and they are doing different things in the zone, it’s tough [for batters] to guess,” Cahill said. The A’s also have pitch-tracking Rapsodo technology for use in between appearances, which Cahill uses to monitor his release point and the underlying characteristics of his pitches — like spin rate — between starts. The well-traveled, and perhaps forgotten about, Jackson has given the A’s 60 quality innings this season — not bad for a guy playing on his 13th(!) MLB team. Jackson has done this by getting crafty: reducing the use of his fastball from 35.3 percent last season (47.9 percent for his career) to 16.2 percent this season. Among the changes Fiers has made since joining the A’s is creating more separation in height between his fastball and curveball, as Jeff Sullivan found for FanGraphs. He has a 1.47 ERA in three starts with Oakland. The makeshift pitching staff is also aided by one of the best infield defenses in the game. That’s an effort led by Chapman. While Chapman is an excellent hitter, he’s the best third base defender in the game according to Defensive Runs Saved — and it’s not close. In fact, his 26 Defensive Runs Saved are the best in the game at any position. The next closest third baseman is Travis Shaw of Milwaukee with nine. Chapman leads an elite Oakland infield defense. According to DRS, the A’s also rank second in DRS at first base and eighth at shortstop in the majors. Moreover, Oakland trails only the Arizona in the difference between expected opponent batting average — based on opponent exit velocity — and actual opponent batting average. The A’s are getting to more ground balls and line drives relative to their infielder rivals. The Moneyball A’s didn’t prize defense, fly balls or ace relievers, but this club does. While the formula is different than in the early 2000s, what remains the same is that the A’s are finding value where other clubs are not. The top four teams by run differential reside in the AL: the Red Sox, Astros, Yankees and Indians. The MLB average is 11.7 degrees. They hit at least one homer in 27 straight road games.